Cabalist and moralist; lived in Algeria, probably at Tlemçen, at the beginning of the sixteenth century. 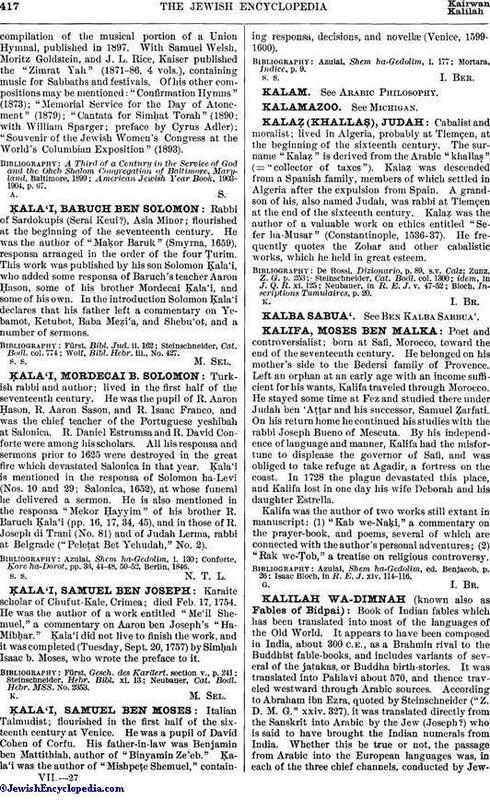 The surname "Kalaẓ" is derived from the Arabic "khallaṣ" (= "collector of taxes"). Kalaẓ, was descended from a Spanish family, members of which settled in Algeria after the expulsion from Spain. A grandson of his, also named Judah, was rabbi at Tlemçen at the end of the sixteenth century. Kalaz was the author of a valuable work on ethics entitled "Sefer ha-Musar" (Constantinople, 1536-37). He frequently quotes the Zohar and other cabalistic works, which he held in great esteem. Bloch, Inscriptions Tumulaires, p. 20.